We’d love your help. Let us know what’s wrong with this preview of Pip's Trip by Janet Morgan Stoeke. To ask other readers questions about Pip's Trip, please sign up. My kids and I loved this story. We have some quirky hens and we could definitely see characteristics of Pip, Maude and Dot in ours! I think Stoeke has said all she needs to say with chickens. If she's run out of adventures for "Minerva Louise" could she please switch to ducks or something? This review has been hidden because it contains spoilers. To view it, click here. There's no place like home. This is what Pip realizes when she goes on a scary adventure all by her lonesome in the Loopy Coop Farm red truck. Safe "back" home she happily exclaims that she has everything she needs at home and no longer cares to travel away from it. I wonder if she would have had the same feelings if her friends, Dot and Midge, had been in the truck with her. Sometimes it's harder to try something new when you've got no one to share it with. Simple but expressive illustrations. Si There's no place like home. This is what Pip realizes when she goes on a scary adventure all by her lonesome in the Loopy Coop Farm red truck. Safe "back" home she happily exclaims that she has everything she needs at home and no longer cares to travel away from it. Simple but expressive illustrations. Silly, overall cute story with half of a good lesson - Home's a good place. Home has the best scenery around. Just love these chickens. This review has been hidden because it contains spoilers. To view it, click here. This is cute story about the adventures of three little hens. Midge, Pip, and Dot always see a truck coming and going from the farm. The wonder where in the world could that truck always be going? One day, they decide that the truck must be going to see the wide world and they want to go along for the ride. But when the truck comes to a stop, Pip is the only hen to get into the truck while Midge and Dot get scared and tell Pip they will be right back. Only Midge and Dot do not come back and Pip This is cute story about the adventures of three little hens. Midge, Pip, and Dot always see a truck coming and going from the farm. The wonder where in the world could that truck always be going? One day, they decide that the truck must be going to see the wide world and they want to go along for the ride. But when the truck comes to a stop, Pip is the only hen to get into the truck while Midge and Dot get scared and tell Pip they will be right back. Only Midge and Dot do not come back and Pip is left alone in the truck. Pip's bravery begins to fade as she hears the loud engine start, she becomes scared of what might be in the wide world. So, she hides beneath a blanket. Once the engine cuts off and is quiet again Pip uncovers herself and opens her eyes to find herself on the farm. Pip believes she just embarked on a trip with the truck but she learns from Midge and Dot that the truck did not go anywhere at all. At first Pip is upset, having thought she was brave enough to go for a ride in the truck. But then her friends help her to realize that even though the truck did not go anywhere, she IS brave. She still got in the truck and the truck was loud and scary. Although this makes Pip feel better she realizes that she does not need the adventure of the wide world. She has enough on her own farm with her friends, she does not need to go anywhere else. This sequel to The Loopy Coop Hens returns to the Loopy Coop Farm and the hens, Pip, Midge and Dot. When they watch the farmer’s truck drive away, the hens start to wonder what it would be like to take a ride in it. Pip thinks that it might be fun and climbs into the back of the truck. But the other two hens decide that they will go get Rooster Sam to go with them, leaving Pip in the truck alone. Pip gets worried, she feels a vibration and it gets noisier. So she hides under a blanket and misses This sequel to The Loopy Coop Hens returns to the Loopy Coop Farm and the hens, Pip, Midge and Dot. When they watch the farmer’s truck drive away, the hens start to wonder what it would be like to take a ride in it. Pip thinks that it might be fun and climbs into the back of the truck. But the other two hens decide that they will go get Rooster Sam to go with them, leaving Pip in the truck alone. Pip gets worried, she feels a vibration and it gets noisier. So she hides under a blanket and misses the whole wide world passing by. When the truck quiets down again, she peeks from under the blanket and finds herself on the farm, safe and sound. Unfortunately, when she climbs down, she discovers that she really didn’t have the adventure she thought she did. 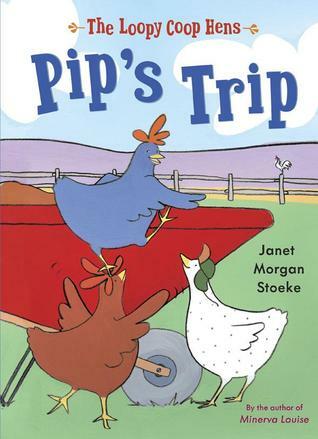 Pip's Trip by Janet Morgan Stoeke, part of the Loopy Coop Hens series, is a simple story about hens that want to take a trip in a truck. Storke's illustrations feature bright colors, and focus on the three hens. One and two pages spreads are used. My favorite illustrations are cover, goes places, room, get in first, getting loud, didn't go, oh, and last 2 pictures. This beginning reader features a large font, lots of repition and humor that should please readers and listeners. The very short chapt Pip's Trip by Janet Morgan Stoeke, part of the Loopy Coop Hens series, is a simple story about hens that want to take a trip in a truck. may make readers feel they are beginnig to read a real book. I prefer the Minerva Lousie books, but beginning readers may find these provide useful practice. 3 stars. The Loopy Coop Hens are back in another adventure. Unfortunately, this one is worse than the first. The hens are fascinated by the farmers truck that gets to go out in the big world and explore. They dare each other to hop in and take a ride. Pip is the only one that gets in the truck. When the farmer starts the truck to test the engine, Pip thinks she is going for a ride. When the other two hens come back from asking Rooster Sam for "permission" Pip is excited to tell them that she went for a r The Loopy Coop Hens are back in another adventure. Unfortunately, this one is worse than the first. The hens are fascinated by the farmers truck that gets to go out in the big world and explore. They dare each other to hop in and take a ride. Pip is the only one that gets in the truck. When the farmer starts the truck to test the engine, Pip thinks she is going for a ride. When the other two hens come back from asking Rooster Sam for "permission" Pip is excited to tell them that she went for a ride in the wide world! They have to tell her that yes, the truck was started, but it didn't go anywhere. But she was still very brave for surviving that much. This is a nice simple early reading chapter book. Each chapter only has four or five page with very simple wording on each page. The illustrations are bright and simple and pleasing to the eye as well. Three hens (chickens) see the truck go and come everyday but they get curious to see where it goes. So they try and be not scared as they climb in the back of the truck, but two get to scared. The adventures that the one thinks she goes through is funny to read about. My special needs adult son en This is a nice simple early reading chapter book. Each chapter only has four or five page with very simple wording on each page. The illustrations are bright and simple and pleasing to the eye as well. I agree with a few others that this fell flat. The story is choppy and jumpy and it didn't cruise well. Julia got a chuckle or two out of it and for such simple illustrations we both really enjoy looking through the Loppy Coop Hens books but the story lost something somewhere. We have yet to read any of the Minerva Louise books (as far as I can remember) and I don't know that I'll specifically find them. Fantastic and hilarious take on chickens at a farmyard. Loved both of these books, especially that they were both "chapter" books. I think they're quite approachable for the young child who wants to be successful with initial reading and additionally quite entertaining for the adult reading the book! A big thank you to Ms. Stoeke for writing these adorable books starring chickens! Any book about chickens sparks my son's interest, and while these books are simpler than his reading level, he really enjoys the story, the clever humor, and the lovely illustrations. the lastest adventure of the Loopy Coop Hens. They girls decide to go see the wide world by getting in the back of the farm truck. Can they do it or will they be to scared? Not bad. I like the illustrations. Nice end with the friends' consoling Pip and Pip being content. Could work in a storytime, but I'm not really behind it right now. A book about three chickens who want to go for a ride in the truck but are feeling aprehensive about it. Broken into mini chapters. Nice story for beginner readers. Pip, the chicken, wants to see the wide world, but she has trouble convincing her friends, Dot and Midge, to go with her. Simple beginning reader--with the short chapters, might be considered for Seuss award next year. Might be good for a beginning reader because of the mostly easy words, but the story is very choppy. Pip is brave and learns that home is sometimes better than anywhere else in the wide world. In a world that has no shortage of chicken or farm books, this story is cute but not remarkable to be a favorite with me. Stoeke has a talent for giving these silly chickens extremely expressive eyes.